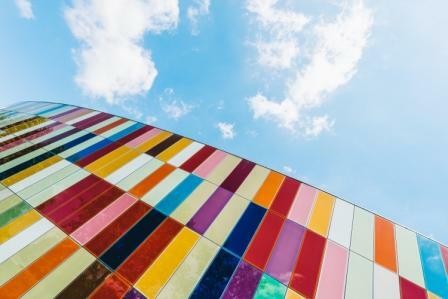 Want to know the Psychological effects of colors ?! Read this ! Create an airy, refreshing, pure and clean look for a home. The color white makes a room feel large and add light in darker spaces. On its own, White can look cold and sterile. To soften the look, it is best to play with different tints. (associated to Purity, innocence, cleanliness, sense of space, neutrality). Elegant choice for an interior design color scheme. The color Black draws attention. It demonstrates power and prestige but it also eats light. Black is a perfect accent color. Used in small touches it will enhance your home sophistication. Dark shades tend to become the “new black”. Charcoal, deep purple (like the new “Shadow” from Benjamin Moore), dark brown, deep blue, dark green. Subtle, elegant, formal, but sometimes conservative depending on the shade. The color gray brings calm and confidence, especially when combined with neutral shades or whites. But Gray can also create a great balance with bold and bright color touches. Gray is an amazing but not easy choice. It is important to choose the right shade, the right combination. Check the room, the light, the space, the surface and choose the right sheen. Very powerful color, red create a vibrant stimulating feel in your home. The psychological effect depends on its intensity. It is a happy, fun, energetic, warm color. Orange carries excitement, enthusiasm and stimulation. The color orange can be very powerful in bright hues or gentler in earthy shades. Terracotta oranges are often associated with Mediterranean style (Italy Tuscany, French Provence, Spain). The color Yellow is nice when used in small touches or in accessories, decoration or frames. Yellow add a burst of sunshine to your home. Calm and relaxing Green is very soothing to the eye and nature gives us a lot of nuances. Cool and clear look. Blue enlarges a room with light shade. It cools it when it receives too much sun and heat. Luxurious, serene calm, and mysterious. Feeling of naturalness, depth, warmth and comfort, Brown is a neutral and welcoming color. It is the color of earth that conveys a sense of security and stability. Depending on the shade, brown creates a rustic effect. Fresh and fine atmosphere, delicate and sometimes girly. The psychological effect of the color pink is described as comforting and soothing. I loved reading about all the different ways color can impact the feel of the home. This was a great and easy read that got me dreaming about possibilities: a true sign of a good blog. 🙂 May I share your blog page in our next business newsletter in May?